Last week, I spent the evening on a ride-along with the Anchorage Police Department, learning and observing firsthand what police officers encounter every day. Thank you to Captain Sean Case for allowing me to accompany him. Last week, I rode along as Captain Sean Case responded to incidents related to drugs, driving under the influence, domestic violence, shots fired, and mental health. The driving under the influence incident appeared to be a case of drug intoxication rather than alcohol intoxication. The individual drove off the roadway and crashed into an Anchorage residence. Luckily, the driver did not injure anyone in the residence and the airbag deployed in the collision. One issue brought to light during my ride-along is violent behavior occurring at Bean’s Café and Brother Francis Shelter. One possible explanation for some of the hostility, violence, and medical calls is the lack of services and diversion available between 1:00pm (lunch at Bean’s Café ends) and 5:00pm (check-in begins at Brother Francis). During this time, there are limited coordinated or supportive services for homeless individuals, which often leads to incidents related to substance abuse. Bean’s Café and Brother Francis Shelter are looking at potential changes to their schedule to address some of these concerns. The ride along experience reminded me how fortunate we are to have courageous men and women protecting and serving our community every day. Anchorage Police, State Troopers, and police officers throughout Alaska are vital parts of our communities. The repeated incidents involving alcohol abuse, drug abuse, and mental illness is also a reminder of our responsibility as a state to reinvest in substance abuse treatment and behavioral health treatment programs as a critical component of improving public safety for Alaska. Rep. Claman with APD Captain Sean Case. 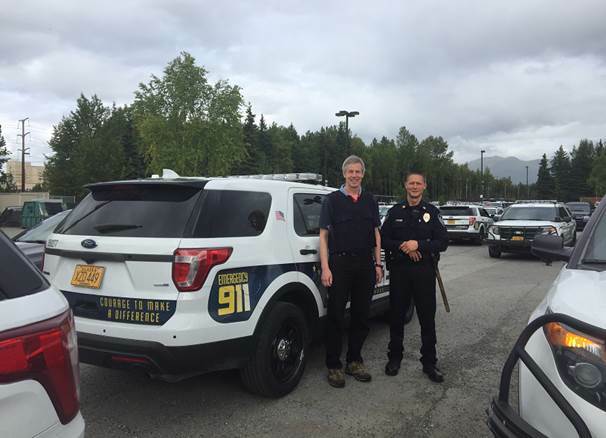 I encourage others to take advantage of the opportunity to ride along and get a firsthand look at what it’s like to be a police officer in Anchorage. You can sign up online by filling out this application: http://www.muni.org/Departments/police/Documents/Ride-along%20application.pdf. 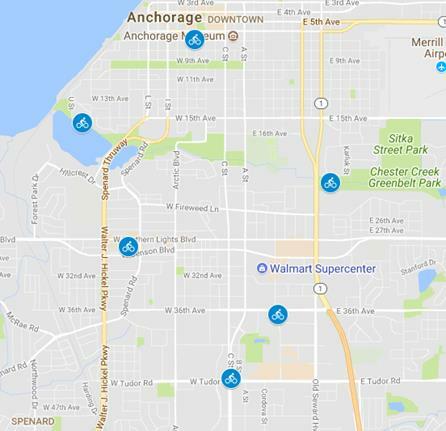 I have heard from several West Anchorage friends and neighbors who are concerned about public safety in their area. I will be hosting a public safety meeting in coordination with the Anchorage Police Department in mid-October. Stay tuned for more information! 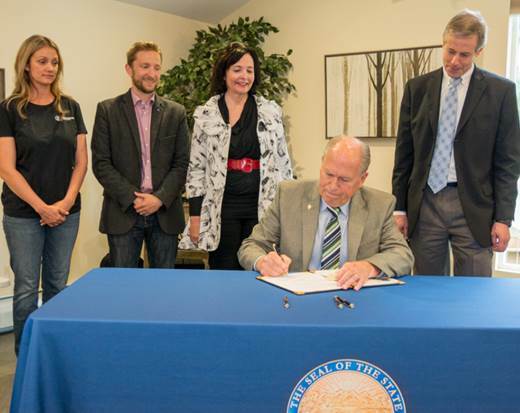 Three weeks ago, Governor Walker signed House Bill 108, legislation I sponsored that modernizes Alaska’s fiduciary law for the digital age. 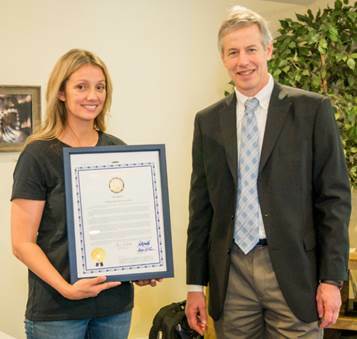 Thank you to the Turnagain Social Club for hosting the bill signing in their new facility in West Anchorage. Governor Walker signs House Bill 108, sponsored by Rep. Claman. 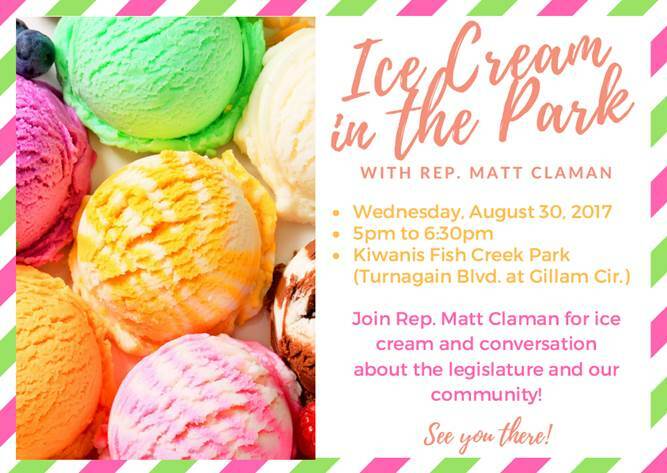 Also present: Kori Mateaki of Turnagain Social Club, Rep. Grenn, and Sen. Hughes. House Bill 108 Bill Signing at the Turnagain Social Club in West Anchorage. 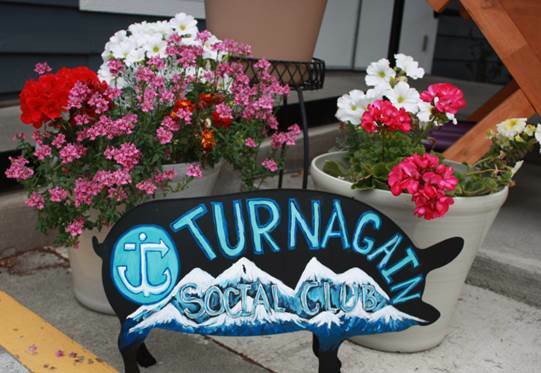 Turnagain Social Club (TSC) is an adult day services facility that provides critical social and therapeutic services for Anchorage’s older population. Owner and President Kori Mateakirecognized the need for adult day facilities in Anchorage and wanted to create a social gathering place for the elderly where staff could also provide high-quality care for people with degenerative disorders. She opened Turnagain Social Club in late 2016. 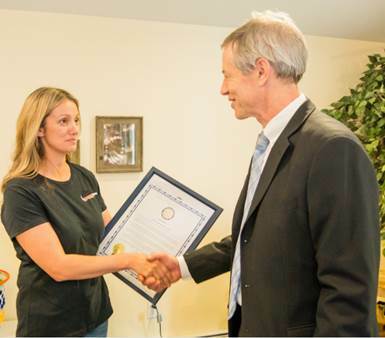 I had the privilege of meeting Kori and her staff at Turnagain Social Club to present a legislative citation for their accomplishments. Turnagain Social Club occupies the building where the Anchorage Unitarian Universalist Fellowship met for many years. First built in the 1960s, TSC remodeled the historic location to make it a state-of-the-art facility with spaces that provide therapy, entertainment, socialization, and care for its members. TSC assists individuals 55 years and older and adults of any age with disabilities. Staff are trained in compassionate, person-centered care and are qualified in medication administration, nursing oversight, cognitive optimization, Alzheimer’s care, and other disease processes. They even offer animal-assisted activities and pet therapy, which help individuals experiencing depression, anxiety, and pain. Their newest therapy pig, Kalua, provides social interaction, exercise assistance, and entertainment to members. Alaska has the fastest growing senior population in the nation. In 2006, about 40,000 state residents were 65 years or older. Today, Alaska’s senior population is more than 70,000. According to State demographers, the number of Baby Boomers—people born between 1946 and 1964—will expand by 68 percent between 2014 and 2024. With this rising trend, health care support and social services employment is forecasted to grow. 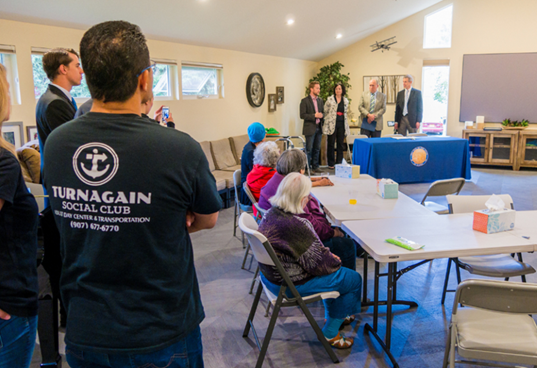 Now, more than ever, Alaska needs facilities like the Turnagain Social Club to ensure that our seniors and elders, those who built this state, can continue to make Alaska their home. The tour will visit four gardens in the Airport Heights, Turnagain, South Addition, and Fairview neighborhoods, showcasing surprising examples of backyard agriculture in our urban town. 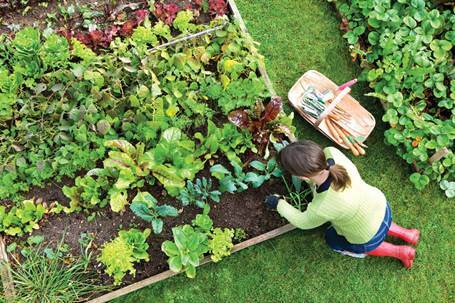 While all of these gardens are past their youthful beauty, they are in their productive prime. Highlights are a small-production farm, a self-pay market stand, and thornless raspberries, fruit trees, grapes, asparagus, and corn. This is a reprise of the 2015 Harvest Tour. Come again, if you like, and see how they've grown! Details: Meet at 5:30 at the Airport Heights Fire Island Bakery. 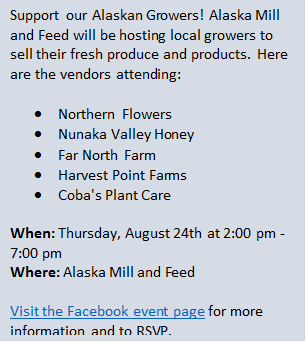 “Nibbles” and a tour of the on-site Urban Farm LLC will be provided. Ride starts at 6:00 p.m. About 11 miles total distance. The final stop will be at 1236 Nelchina Street (1.2 miles from the start). Visit the Facebook event page for more information and to RSVP. As always, please let us know if you have any question or concerns. Submit your letter to the Alaska Dispatch News via e-mail, a web form, or fax them to 258-2157, attn: letters to the editor.